It’s not just about finding that perfect Scottsdale Az spa. It’s about finding the right spa for you. There are some in the area, to include the Phoenician Spa Resort, that cater to a wide range of clientele and offer a multitude of services. From massage and the variations thereof, to facials and body wraps, guests know that at the spas Scottsdale has to offer, they can select their treatment and expect an afternoon of pampering and relaxation. But what should you really be looking for when it comes to the ultimate Scottsdale Arizona spa experience? We would like to offer this brief guide reviewing what you can expect when visiting one of the many spas Scottsdale has. The services offered and even the questions that you should always feel free to ask of your spa host, massage therapist or esthetician. This is after all about you. It’s about giving you comfort, peace and an overall soothing timeout from life for awhile. Yeah, that sounds pretty good to us too! 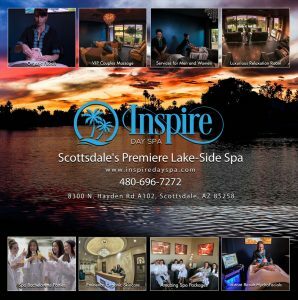 Inspire Day Spa and New Serenity Spa, both spas Scottsdale az, invite guests to come in, unwind and choose those treatments that meet their needs. We want to give clients that crucial “me” moment that too many of us simply don’t take enough time for. Many, when thinking “spa,” generally think massage almost automatically. Of course spas are the meccas of massage. Massage is ideal for those who’ve had a long week, or perhaps are plagued with aches and pains. Maybe you are even just looking for a fun couples day out. When it comes to treating yourself or a loved one, what better day than a spa day! Two of our guests’ favorite: The Inspire Massage and Serenity Massage. Our signature massages, these treatments allow for more of an entire body experience. Our therapists focus on the more traditional areas such as the back and shoulders. And also, depending on which treatment option you choose, there are warm towels, and a luxurious scalp massage. With the Serenity, you get a foot sugar scrub. Again, when searching spas Scottsdale for the ultimate day of pampering, look and see what their signature massages entail. Are they addressing those areas that you need? Do they include extra special touches designed to make you feel amazing afterward? Deep Tissue and Swedish Massage are also incredibly popular options at many spas in Scottsdale az. According to recent studies, over 15 million Americans have used massage therapy. Not only is there the relaxing factor, but for those healing from sports injury, certain types of surgery, or dealing with chronic pain, massage works. With both deep tissue and Swedish massage, you get a technique that uses both lengthening and shorter cross strokes. This really stimulate and thus help muscles to release. The focus is on the inner layer of thick muscle as the therapist applies strong pressure. Some may experience a little soreness afterward. So if you do have any questions and concerns prior to your massage, it is important to bring them up with your therapist. On a lighter note, many guests come to both Inspire Say Spa and New Serenity Spa to try couples massages. If you haven’t tried it, it is definitely long overdue. Sometimes couples just need to spice things up, maybe you want to do a date night that’s different from the run-of-the-mill movie and dinner. Enter: couples massage. Numerous spas Scottsdale Az offer variations of couples massages. We definitely like to cater to our couples. Depending on the package you choose, we provide champagne, refreshments, flowers to accent an already gorgeous setting. Couples massage is very popular when it comes to why people visit the spas Scottsdale has to offer! There are also a variety of specialty massages that you can try during your scottsdale AZ spa visit. From hot stone massage, to lomi lomi massage, to a prenatal massage for those mommy’s to be. It’s about new experiences and one of the best ways possible to find that relaxation you seek. When Visiting Spas in Scottsdale Go for the Facial! Massage isn’t the only reason people visit Phoenix area and Scottsdale az spas. Facials, especially in the last 15-20 years, have become a day spa staple. And now with new products and technologies emerging, spa facials are reinventing how many approach skincare. And of course, they let you indulge in relaxation for a bit. At Inspire Day Spa we offer a variety of facials as well as products from the all-natural Eminence line to enhance skin tone, texture and appearance while giving the client a truly wonderful experience. A facial is about more than what goes on your face—it is after all, a comprehensive process. Many rave about our signature Inspire facial. A thorough cleansing, followed by the exfoliation of dead skin, prepares the surface for the topical products which help to hydrate, tighten pores and enhance the overall appearance of your complexion. You may want a facial geared toward anti-aging. We all want to fight those telltale fine lines and wrinkles. Scottsdale spas offer a variety of ways and products that can help do just that! Our Age with Grace facial for instance infuses the skin with hylauronic acid as well as those peptides necessary to help break down the old cells and also stimulate collagen and elastin production. In terms of even more advanced facials available, the Hydrafacial is becoming hugely popular. What is a hydrafacial exactly…this treatment essentially combines the best of microdermabrasion, high-level extraction and then ultra hydration to leave your face feeling smooth and just plain incredible. Numerous celebrities swear by the hydrafacial for dealing with everything from blemishes to oily skin to pigmentation issues. Spas aren’t just about massages and facials. In fact, the spa industry is booming precisely because they offer a wide array of new and exciting treatments and services. Especially in the Phoenix az area, you can find all sorts of wonderful spa experiences—all you have to do is look. Body wraps are becoming all the rage. Enjoy for instance a blueberry and soy slimming wrap. Natural, hydrating and terrific for your skin, this wrap helps create an overall more contoured and toned look. Or you might go for the anti-aging body wrap done with dark chocolate cocoa. Miraculous when it comes to fighting the signs of aging. Yoga/Wellness Experiences are really starting to be seen more and more at Arizona day spas. At both Inspire Day Spa and New Serenity Spa, we don’t just emphasize relaxation, we also stress the need for mind/body/spirit wellness. At New Serenity Spa for instance we have life coaching services available. If something is holding you back. If you feel you’re not reaching your full potential, we can help. We show you how to clear your mind, set a path and work toward that which you want to achieve! Events & Parties are often held at spas in Scottsdale. From corporate events featuring decadent cheeseboards to bachelorette gatherings, to just an all-out fun girls days, day spas in Scottsdale are a great place to hold a party! While certainly this is a about a day of being spoiled and taking it absolutely easy, there are certain things you can do to help you prepare for your Scottsdale or Phoenix spa day. Keep it light—eating a big meal right before your spa day isn’t recommended. You don’t want to feel tired and/or bloated because you’re stuffed. It’s about feeling healthy and cleansed. Shower before you go—again, in keeping with the cleansing theme, you want to feel refreshed and ready to thoroughly enjoy your treatment of choice. Dress comfortably—while you may put on a robe when you get to the spa, wearing lighter and comfortable clothes will help you get into that “this day is about relaxation” mindset! Don’t be afraid to ask questions—if you’re not sure, or have concerns about a certain treatment, by all means ask. That is what we at Inspire Day Spa are here for: to help you feel comfortable and to address all questions. Stay hydrated—especially with some of the Scottsdale spa massages available, the more water you drink beforehand, the better! We pride ourselves on not only the luxurious interior along with of course the amazing treatment options, but also our exterior space. There are not many spas in Scottsdale that feature such an inviting and enjoyable outdoor scene as well. Located along Lake Marguerite, we have views galore. Not only that, but there are plenty of outdoor picnicking spots around the facility. What better way to spend a day then getting pampered with a massage or facial. And then lounge about outside enjoying the birds, the water, the weather! 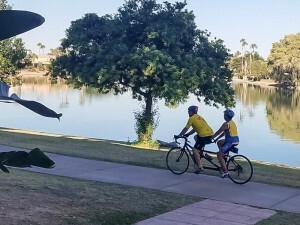 There are biking trails, hiking trails, even a farmer’s market nearby. Your Scottsdale Spa day should be about you. What you want, the type of relaxation and de-stressing that you seek, in the environment that you desire. Inspire Day Spa certainly focuses on meeting our clients’ wishes. We look forward to seeing you. If you have any questions at all, please don’t hesitate to call or even stop by and ask!